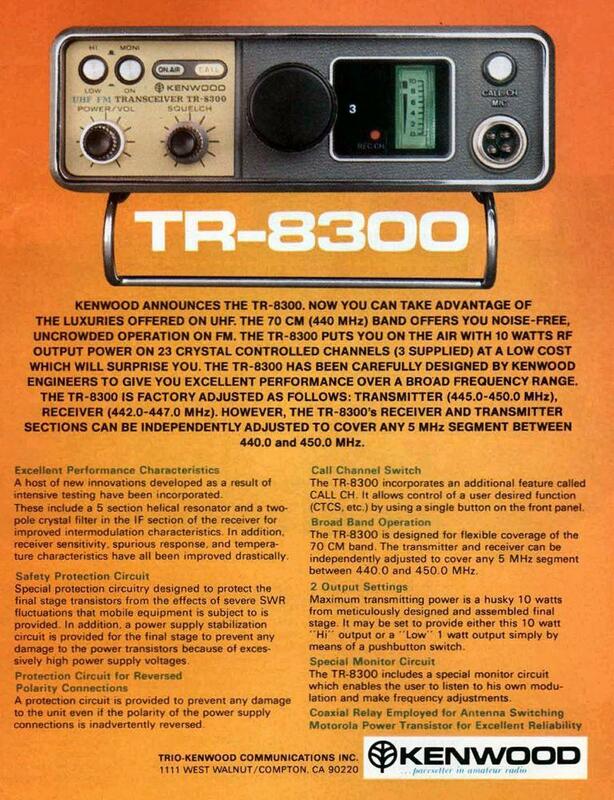 Kenwood TR-8300 is a 70cm mobile FM transceiver. Power output may be set for 1 or 10 watts. It has a 23 channel capacity with 3 channels supplied. Standard supplied frequecny coverage is 440-445 MHz transmit and 442-447 MHz receive. But the radio may be adjusted for any 5 MHz segment from 440 to 450 MHz. Requires 13.8 VDC at 3 Amps. 7.125 x 2.375 x 9.5 inche 5.1 lbs. 23 xtal channels in the range from 430-440 MHz; Pout: 10 W.